What--a new cookie?? I couldn't believe I didn't have this cookie on my blog. I checked and drooled as I looked through many chocolate chip cookie recipes. Why is this different?? Well, it has a high butter ratio. Which makes them taste divine. There is a small amount of oatmeal. This adds to the crunch but doesn't scream, "Hey this is an Oatmeal Cookie". They are the perfect combination of crisp and chewy. I had the best luck with a small cookie scoop (heaping tablespoon). I tried making a bigger cookie (2 tablespoons) but the dough spread too much. In this recipe smaller is better. Choose your favorite chocolate ---milk, dark, chunk or mini. Don't ruin a good cookie with inferior chocolate! This is a delicious cookie, enjoy and share! I found the recipe on one of my favorite blogs, Let's Dish! In the bowl of a stand mixer combine butter and sugars, beat well about 3 minutes. Add egg, egg yolk and vanilla, mix well. In a bowl stir together flour, oatmeal, baking powder, soda and salt. Add to wet mixture. Gently stir just till mixed. Add chocolate chips. Refrigerate for 30 minutes. Using a small scoop place cookie dough on a parchment lined sheet. Bake at 350 for 10-12 minutes. The cookie should be light brown and the edges will be darker. Do not over bake. Let cookies cool for 2-3 minutes. Remove from cookie sheet and finish cooling on a wire rack. I get excited when I try a new recipe and it exceeds my expectations. Sheet Pan Chicken Fajitas came together easily and the finished product was delicious. Fajitas are usually cooked in a very hot frying pan. It is a meal that requires last minute craziness. The prep for Fajitas is is the same however you cook them. I just like the idea of letting the oven do the cooking, it is basically unattended. That is good. While the Fajitas are cooking I am free to prep the yummy toppings that must accompany Fajitas. 2 jalapenos--do not use seeds or membranes for a milder flavor. I do wish there was a way to know just how hot a jalapeno is! I always use food prep gloves when handling jalapenos. I have learned the hard way. Jalapenos add a wonderful flavor. We love them! 2 tablespoons taco seasoning, I make my own because I have to do something with all the Penzys spices I own! I'm sure you could use a package mix. Penzys also has a yummy Fajitas blend. So many choices. I think the point is to season well! Preheat oven to 425 degrees. Brush a large sheet pan with oil. Scatter peppers, onions and chicken on sheet pan. Sprinkle with taco seasoning and drizzle with olive oil. Use tongs to toss until everything is coated--spread in an even layer. Bake uncovered for 30 minutes, stirring half way through. Serve on warm tortillas with lots of garnishes. This recipe came from The Yummy Life. This post is all about frosting. Choose your favorite brownie recipe or make a box mix. This frosting will elevate any brownie! This is the only chocolate frosting you will ever need, it's that good. It is yummy on brownies, cake, cupcakes and graham crackers too! And it is easy. 1 cup semi sweet chocolate pieces that's about 6 ounces. I like Ghirardelli. If I can't find Ghirardelli chocolate chips I will chop up a semi-sweet baking bar. Please don't cheat and use milk chocolate or cheap chocolate--you can, it just won't be wonderful! Melt chocolate and butter over low heat or in the micro--watch carefully as it scorches easily. In my old age I can't multi-task. So when I melt chocolate, I melt chocolate! Sad but true. Let mixture cool for a few minutes then add sour cream and salt. Gradually add powdered sugar and beat till smooth. It's delicious! Frosts a 9x13 pan of brownies or 24 cupcakes. 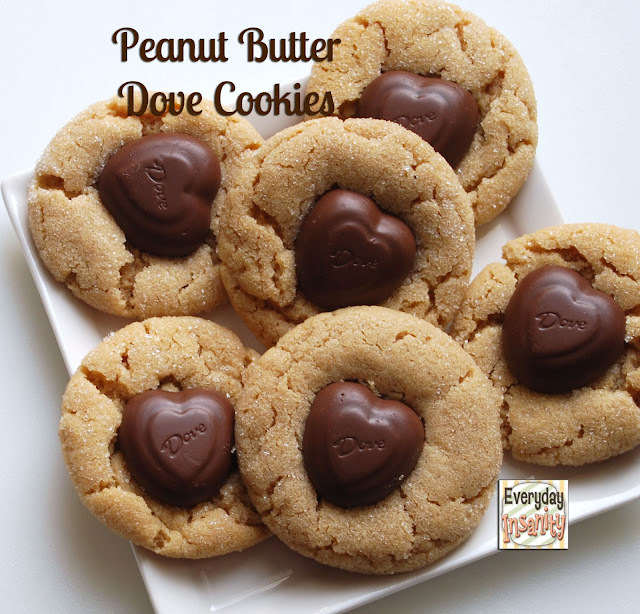 My blog has about 38 recipes that contain peanut butter. I do like peanut butter. In cookies, brownies, candy and even sauces-- think peanut sauce. I have a Peanut Butter Swirl Brownie recipe that is excellent. Peanut Butter Bars are a family favorite. So why another peanut butter brownie recipe? Because I can! I would feel bad if I didn't share this recipe. I made it twice in a week--that is how good it is. It is easy, like one bowl easy. These brownies are so perfectly delicious that they do not need frosting! Did I really just say that--I frost everything. They are the perfect combination between chewy and cakey. The peanut butter is subtlety delicious. My non-peanut butter loving mother thought they were excellent. They freeze well--and taste delicious right from the freezer. This could be a new family favorite. Best of all you probably have everything you need in your pantry to make them, tonight. Whip butter and peanut butter together until smooth and creamy, about 2 minutes. Add sugar, mix well. Add eggs and vanilla, mix until well combined. Stir in the cocoa, mix until the mixture is smooth and no dry streaks remain. Add flour, salt and baking powder, stir once or twice. Add chocolate chips and gently mix just until combined. Batter will be thick. Spread in a lightly greased 9x13 metal pan. I use a small offset spreader to get batter even. Bake in a preheated 350 degree oven. Bake 25-28 minutes. When done a toothpick inserted near the center will come out with a few moist crumbs. Don't over cook. My brownies took closer to the 28 minute mark. Ovens vary. Use the toothpick test! Cool completely and cut into squares. Serve chilled or at room temperature. This recipe came from my go to food blog, Mel's Kitchen Cafe. Yeah--lunch with my cousins! I know I am 61 but I was excited. We seem to only see each other at funerals. We wanted to gather and laugh and eat and basically reconnect with each other. We had so much fun. It was like we were kids again. Your cousins know you like no one else. They know your parents and grandparents, they know your brothers and sisters. They know more about the struggles and challenges you have weathered. You can be a great support to each other. We had a wonderful time. So good that we have another lunch scheduled for January! An hour before I left I decided to take a treat to share. It had to be quick! I had just seen this recipe on Our Best Bites. I knew it would be good. It was excellent! The kind of treat that you just keep eating. I love Rice Krispie treats in just about any form. The addition of crushed candy canes, white chocolate and dark chocolate made these a treat I was happy to share. So very, very good. So easy to make. 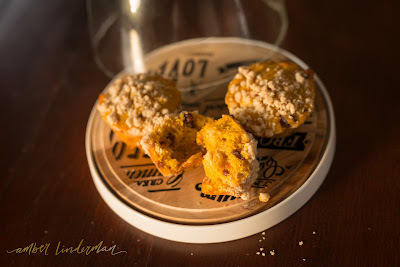 This recipe was made for Christmas Gatherings! I purchase my chocolate discs at Gygi's in Salt Lake City or they are sold in bulk at Winco. I have heard that Sam's Club carries them seasonally. Yes, you could use chocolate chips, just add about 1/4 teaspoon vegetable oil to the melted chocolate and mix. 8 Candy Canes crushed. I crushed them and then put them in a fine mesh strainer. The dust like particles went in the mix with the rice krispies. The bigger chunks were used as garnish after the chocolate had been drizzled. Use about 1 tablespoon of butter and butter a large sheet pan. Don't use Pam--it will taste nasty in this recipe (and I do love Pam--just not here). Melt butter in a large bowl in the micro wave. Add marshmallows to melted butter and stir. Return to microwave and cook for 30 seconds, remove and stir. Continue until marshmallow are completely melted. Add rice krispies, peppermint extract and peppermint dust. Stir until combined. Put sticky mixture in a large buttered sheet pan. I get my hands damp and spread/pat the mixture in place. You may have to re-moisten your hands a few times. Put dark chocolate in a baggie--microwave until melted (my microwave has a chocolate melting button--genius)! Once chocolate is melted cut a very small corner off the baggie. Have fun and drizzle the chocolate all over the top of the krispie treat. Put white chocolate in a new bggie and melt and drizzle. Once all the chocolate has been drizzled quickly sprinkle candy cane pieces on top. Beautiful. Let cool. If you are in a hurry and you live in Utah just put them outside for 20 minutes and your delicious treat is ready. Cut and bag or plate. This recipe was inspired by a recipe on Our Best Bites--I increased quantities but nothing drastic. I have girls--my girls are great cooks. I'm proud to be their Momma. Amber sent an early morning text--she had just created a delicious muffin. I'm sad I live 1000 miles away, it would have been a perfect breakfast. This recipe was inspired by a recipe on Smitten Kitchen. 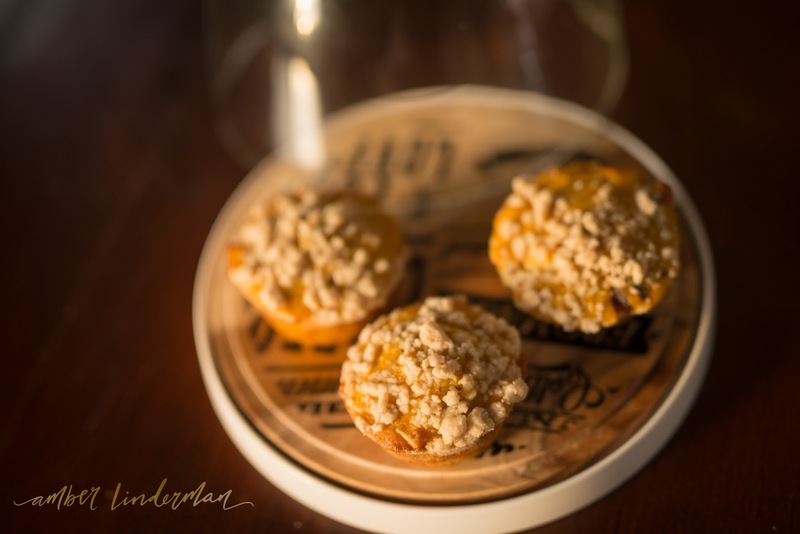 Pumpkin is always a good choice, streusel makes it better. The addition of white chocolate chips and dried cherries sent this muffin out of the park. Amber's hubby, Tadd (who has a palate for fine food) said this was a $5.00 muffin. I will make them very soon. Amber who is also a fine photographer was kind enough to take a photo or two. Thanks Amber. Rub together until pea size. Heat oven to 350. Spray muffin tin with Bakers Joy, put 1 teaspoon sugar in each sprayed cup. Shake the tin around to coat each cup with sugar. Stir together the flour, baking powder, baking soda, salt and spice in a bowl, add the cherries and white chocolate. I a large bowl whisk together the pumpkin, oil, eggs and 1 1/4 cup sugar. Add dry ingredients ad stir until just combined. Divide batter among muffin cups filling about 3/4 full. Sprinkle Sreusel Topping over muffins. Bake until puffed and golden. A wooden pick should come out clean, about 25 minutes. Cool in pan for five minutes. Remove muffins and cool on a wire rack. Most muffins have a short shelf life. This muffin does keep for two days. It also freezes well. I do love pork tenderloin. Once I purchased a good meat thermometer my pork was delicious. Overcooked pork is dry and chewy--not good. Pork cooked to 140-145 is moist and delicious, you can cut it with a fork. Pork tenderloin is really a fast food, you can easily make it on a week night. This recipe can be made in under 40 minutes. Most of that time is cooking/resting. My daughters are great cooks, we share recipes and encourage each other to cook dinner. Jill was kind enough to share this recipe. I am glad she did as I probably wouldn't have made it without her positive review. Really who uses cinnamon when cooking pork? Please trust us, it is so good. It is an amazing combination of sweet and spicy. Add it to your dinner rotation. Heat oven to 350. Trim silver skin from tenderloin and pat dry. I cut the tenderloin in half because it fits it my frying pan better. In a small dish mix together dry rub ingredients. Rub the spice mixture over the pork to coat. Heat olive oil in a heavy, oven safe frying pan till very hot. Quickly brown meat on all sides. It will smell amazing! Leave meat in frying pan. Combine glaze ingredients and spread/pat on tenderloin. Bake 350 degrees for 17-20 minutes. Internal temperature should be 140 degrees. Remove from oven, leave meat in pan and tent with foil. Let rest for 10 minutes. Slice meat and drizzle with pan sauce. I adapted this from a recipe found on Food. I enjoyed a pizza at a local pizza joint that was amazing. It was a Hawaiian Pizza with a hint of barbecue sauce. It was unique and delicious. I am usually not a fan of barbecue pizza (just too much BBQ taste) but a hint was great. This recipe was perfect. Basically an easy homemade pizza sauce with barbecue sauce mixed in. I topped the pizza with roasted chicken, pineapple, cheese and cilantro. I'm sure this would work great cooked on the grill. For the sauce, saute garlic in a little olive oil for 30 seconds, add tomato paste, tomato sauce, diced tomato, and seasonings. Simmer for 20 minutes. Remove from heat and stir in BBQ Sauce. Set aside. Roll the pizza dough onto a stone or pan. I like my pizza crust thin. Pre-cook the dough in a 400 degree oven for about 6-8 minutes. Remove from the oven and spread with pizza sauce. Top with cheese and pineapple. Bake until cheese is melted and crust is done about 8-10 minutes. Remove from oven and top with chicken and cilantro and bacon. I like this recipe because the BBQ flavor is subtle. A combination of cheeses works well with the chicken and BBQ flavor. I like to pre-cook my pizza crust--it allows the crust to cook through and the toppings are not over cooked. I think it is brilliant to add the chicken to the cooked pizza. If cooked chicken is allowed to cook another 8-10 minutes at 400 degrees you get chicken leather--not good. I like the pineapple cut in small pieces. I want pineapple in every bite. This is a great recipe. Enjoy! My oldest granddaughter was visiting last summer. I took her to the fabric store and let her pick out some fabric for a quilt. We talked about color, pattern, scale, design etc. Maya has a great eye (like her Mom) and knew exactly what she wanted. She picked out some beautiful fabric--no flowers just clean lines. 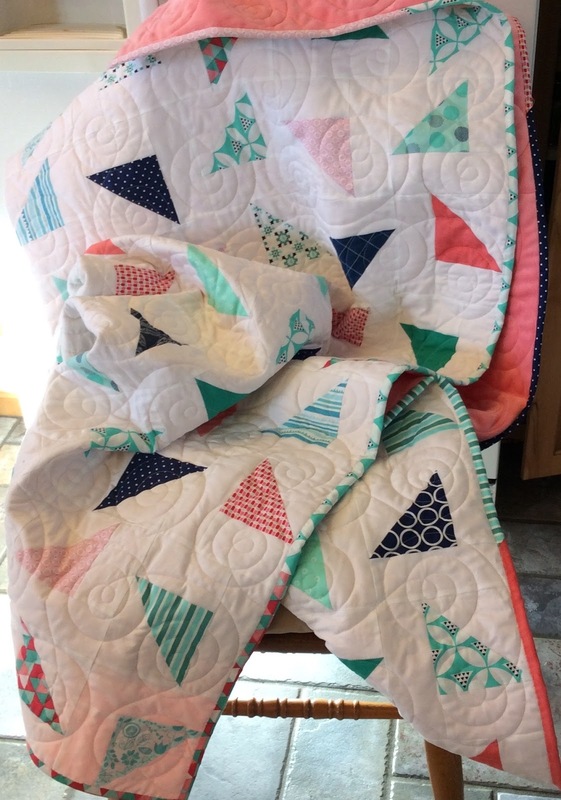 Maya's quilt was designed with half-square triangles--lots of them! I was able to practice my skills with a seam ripper. I made plenty of mistakes (it looked so simple). Greg was kind enough to draw me a pattern that made sense to me. I purchased a ruler years ago--it has odd markings and really made no sense to me. I did a little google research and discovered the odd ruler I had was used to square up half-square triangles. What a gem, this ruler helped me make perfect half-square triangles. 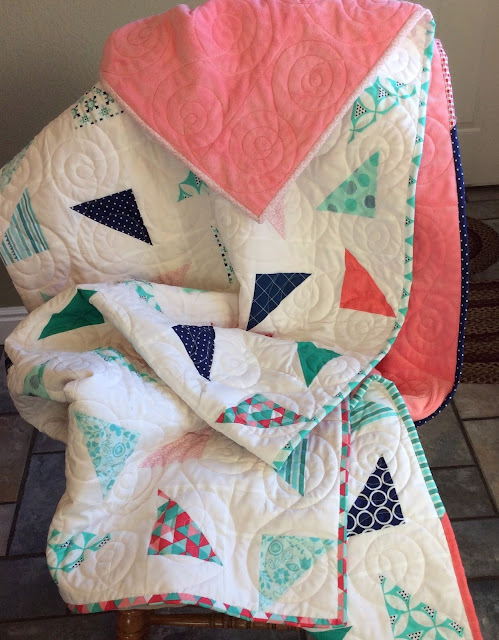 The quilt was a success. I put some beautiful soft minky on the back and finished it with a scrappy binding. 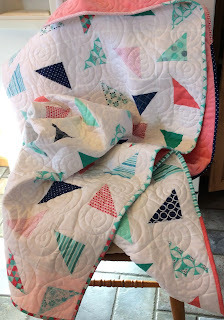 Thanks Maya for letting me develop my quilting skills. Maya's happy place is in my scrapbook room. It is paradise for a creative pre-teen. Maya will spend hours in this room making signs, lists, notes and anything with glitter. She also likes to organize all my supplies--now that is helpful! This yummy dessert comes from America's Test Kitchen. I have quit taking cooking magazines and buying cookbooks because there are so many great recipes on line. However, I do pay for a yearly membership to America's Test Kitchen. I love this site--it has so many excellent recipes, cooking tips and product reviews. It includes recipes from Cooks County, America's Test Kitchen and Cooks Illustrated. It is my go to sight for any good recipe! This recipe was for a 9x13 cake, a perfect family size cake. But there are just two of us now and I really don't need a 9x13 cake tempting me! I halved the recipe and it made 16 beautiful cupcakes. I ate a cupcake and then quickly shared the remainder with friends. It is a win/win. Mix together flour, baking powder, baking soda, spices and salt. Shred the carrots using the large holes of a box grater (you should have about 1 1/2 cups). Mix together the granulated sugar, brown sugar and eggs until thoroughly combined, about 45 seconds. While mixer is running add the oil in a slow steady steam. Mix about a minute longer or until mixture is light in color and well emulsified. Turn off mixer and stir in carrots and dry ingredients until incorporated. Stir in toasted pecans. 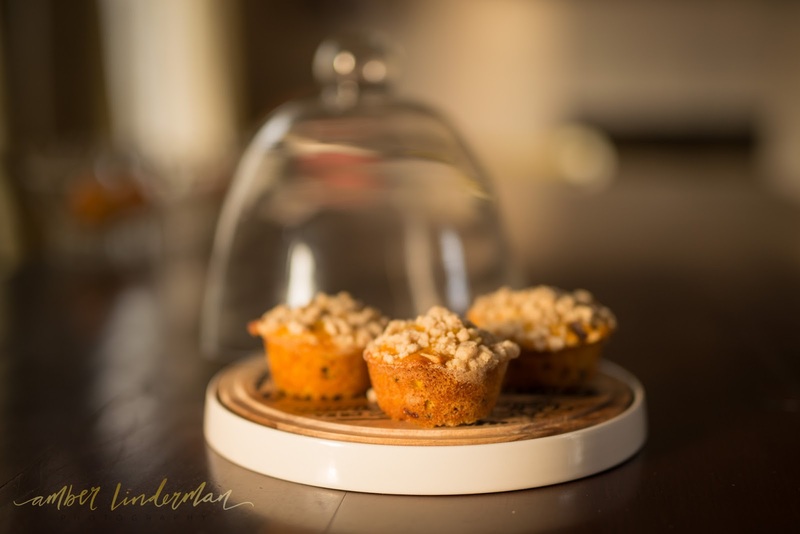 Using a large scoop put batter into a paper lined muffin cup. Bake at 350 degrees for about 18 minutes or until toothpick comes out clean. Let cool and frost. Mix together cream cheese, butter, sour cream and vanilla using a mixer set at medium speed. Mix about 30 seconds or until well combined. Add confectioners sugar and mix unticakel fluffy--about 1 minute. Put frosting in a pastry bag with a large star tip. Pipe frosting onto cupcakes. Refrigerate cupcakes. This cream cheese frosting is perfect, it is my go to cream cheese frosting recipe. If you really want a 9x13 cake just double the cupcake ingredients and bake for about 35-40 minutes. The frosting recipe will make enough for a 9x13 pan. I like cupcakes because they are just so cute, they also have more frosting per cake ratio. That is always a good thing! I was introduced to this recipe many years ago at a Pampered Chef Party--I think it was the reason I purchased my Food Chopper. I usually dice using my favorite chef's knife but sometimes The Chopper is the best tool for the job. I made this Fruit Salsa for book club--it was a hit! I forgot how much I like it. It is fresh and delicious, I think your family will love it. Mix fruit in a bowl. Combine zest, juice, sugar and jam. Gently combine mixtures. I used my Food Chopper for the apples and strawberries. I think I got carried away while chopping the berries, next time I will hold back a bit. I'm sure this recipe would work with different fruits. The apples give great texture. Whole raspberries or blueberries would be a great addition. Cut tortillas into strips or wedges, place on baking stone. Spray lightly with Pam or water and sprinkle with cinnamon sugar. Bake at 400 degrees for 10-12 minutes until crisp and lightly brown. Cool. A drizzle of chocolate is always a good thing. When our kids come to visit they always request a roast beef dinner cooked by their dad. Greg has this meal perfected. He makes the meat, gravy and mashed potatoes. I take care of the sides and the dessert. It is a perfect team effort. When my health declined and Greg was released from his 5 year calling as a bishop of our LDS ward he suddenly had time on Sunday. He wanted to help with Sunday Dinner. He wanted to find a foolproof Roast Beef recipe, one that made delicious gravy. My past attempts at this meal were sometime good, sometimes not so. I did what my Mom did--put a roast in a pan, cooked it for hours and hoped for the best. Sunday dinner was always yummy at Mom's. Long story, we'll shorten it. So Greg wanted a recipe were he could have controlled results. Cook's Illustrated to the rescue. I had their cookbook The Best American Classics on my shelf. It had a simple pot roast recipe. From this recipe came The Perfect Roast Beef Dinner. This recipe is not difficult but does require cooking time. Pat the roast dry with paper towel, sprinkle generously with salt and pepper. Heat the oil in a large heavy bottomed dutch oven, I use a le Cruset pan. When the oil is shimmering add roast and brown on all sides. This will take about 8 minutes. Transfer the roast to a large plate. Reduce heat to medium; add onion, carrot and celery to the pot and cook, stirring occasionally, until browning begins. Add garlic and sugar, cook until fragrant, about 30 seconds. Add the chicken and beef broths, scrapping the bottom of the pan with a wooden spoon to loosen brown bits. Return the roast and any accumulated juices to the pot. Add enough water to come halfway up the sides of the roast. Place a large piece of aluminum foil over the pot and cover tightly with a lid. Bring the liquid to a simmer then transfer the pot to the oven--heated to 300 degrees. Cook turning the roast every 30 minutes until tender. This will take about 31/2 to 4 hours. Transfer the roast to a carving board, tent with foil to keep warm. Strain drippings. Allow fat to come to the top (we use a fat separator). Use drippings to make gravy. Gravy is simple--for every cup of drippings you need at least a tablespoon of fat (there is usually plenty of fat in the drippings). Mix 2 tablespoons flour in some water, whisk well, you don't want any lumps! Add flour/water mixture to 1 cup warm drippings. Bring to a boil stirring constantly. Let boil gently for 2 minutes. Adjust seasonings. We come from a long line of gravy loving ancestors. 1 cup of gravy would never do. Just increase amounts--keeping proportions the same. Today Greg made about 4 cups of gravy. He used 3 1/4 cup drippings, mixed 8 tablespoons flour with 3/4 cup water.